JVC launches IP bonded uplink bridge to live stream from multiple cameras. Wayne, NJ, April 2017: JVC Professional Video has announced the PB-CELL200 ProHD Portable Bridge, a robust bonded LTE hotspot that streams signals from multiple ProHD, 4KCAM, and JVC PTZ streaming camera models for live broadcasts or webcasts. 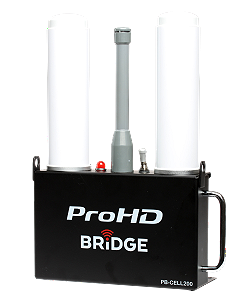 JVC will debut its ProHD Portable Bridge at the 2017 NAB Show (Booth C4315), which runs April 24-27 in Las Vegas, Nev.